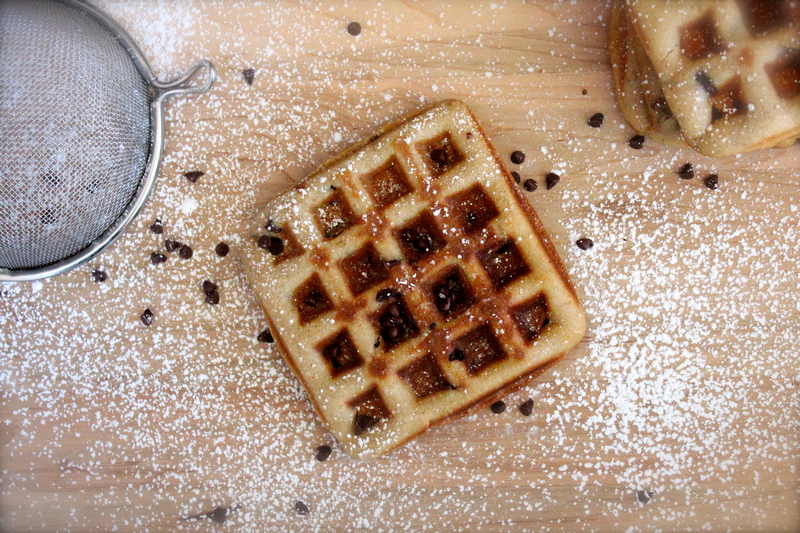 Happiness Project #40: Cookie Batter Waffles! Every month, for one glorious week, I travel 3 hours south, to where my sister & 3 nephews live. And even though I’ve been taking Ari with me, for a good 5 months now, it’s always a little bit like opening a huge, musical present on Christmas morning, filled to the brim with bubbles, legos, splashing, laughter and warm, giggly hugs! I am incredibly lucky enough to have one of those (somewhat rare) very close & loving relationships with both of my sisters, even though my oldest sister doesn’t live in the same area as the majority of my immediate family does. And now that I am finally FREE from so many of my previous health challenges (which prevented me from traveling), I am always incredibly excited about my special “Sister Adventure” trips! So is my (now) 17mo Daughter! Who ADORES her three VERY affectionate & loving cousins. ADORES them! Like no other! Cousin time that she doesn’t really have with any of my closest relatives (here in the Bay Area). Though, considering how much of an introvert I still am (in combination with my daily battle with PPD, anxiety and Menopause, yes, I did say Menopause at 36 years old), I’m fairly convinced that some of this “isolation” is partly my fault. Hence, our monthly trips south. With my oldest sister, I feel SAFE, which is a VERY important thing to me, especially since becoming a Mom. 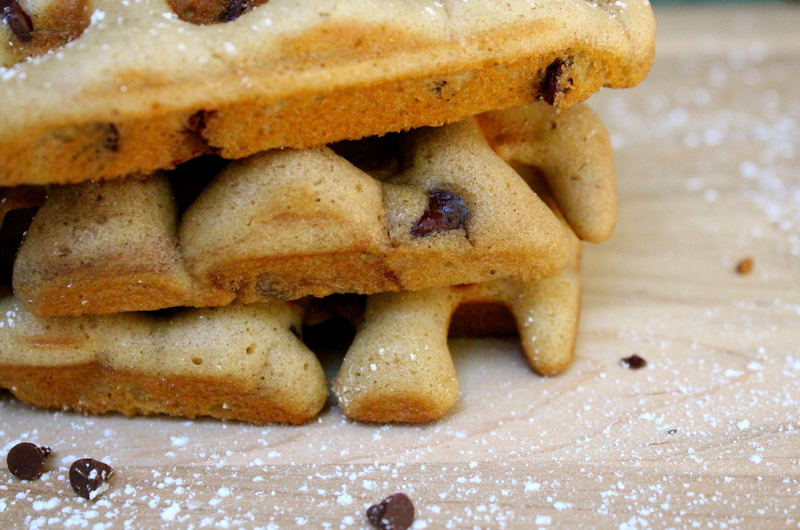 Gather up all of your cookie dough ingredients, as well as your trusty waffle iron. My sadly neglected Cuisinart Waffle Maker has been sitting unused behind my coffee machine, for nearly a good year now. I’m quite convinced that if this pretty, little machine could talk, it would have been scolding me one minute yet joyfully singing out it’s freedom the next. In a large mixing bowl, combine the flour, baking soda, salt and cinnamon, stir to mix. Set aside. In a stand mixer (or by hand held mixer), beat together the melted butter, brown sugar and granulated sugar, for 2-3 minutes, until throughly combined. Beat in the eggs, one at a time, followed with the vanilla. Drop your mixer speed down to low and add in the flour mixture, until just blended. Stir in up to 3 tablespoons of milk to create a silky, liquid-like dough texture, instead of a traditionally thick cookie dough batter. A liquid-like batter is essential for creating a good waffle dough. Lastly, but most importantly (because, well, it’s chocolate), stir in those chocolate chips. Once your waffle machine is prepped and ready, drop about a cup full of the cookie dough into each waffle segment and let bake for 4-5 minutes. If you’re not sure if your waffle maker is made with a non-stick iron, then lightly spray each segment with butter, before adding any cookie dough to it. Your waffles will be ready for consumption when the edges are lightly browned and the waffle is slightly springy to the touch. Oh, and when your entire house begins to smell just like a cookie! That’s the WHOLE idea, right? Right. Best thing about these waffles? They taste just like the actual cookie so you don’t even need to add any topping to them. Unless you REALLY want butter, syrup and powdered sugar. They’re your waffles, after all! Though a scoop of Vanilla Ice-Cream might be fun, too. Just because.